Visual Six Sigma is a practical and pragmatic approach to data analysis and process improvement. Visual Six Sigma deploys easy-to-use, highly visual software that can accelerate the process of analysis and eliminate the need for advanced statistical analysis in all but the most complex situations. 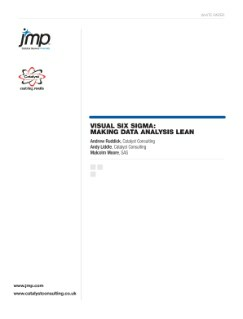 This paper uses as case study to describe and illustrate the Visual Six Sigma.